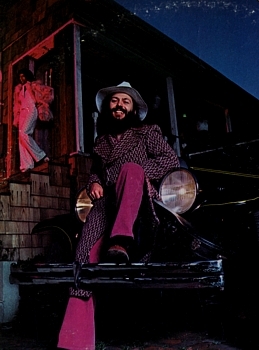 This album was recorded at the end of 1972 while Domenic was still a member of the James Gang. In the past, I was quick to criticize this album, but my musical tastes have matured quite a bit and now I can fully appreciate Domenic's effort in making the album. My only complaint is that the LP could have used another song or two to lengthen the playing time for optimal enjoyment. Tricky is worth finding for the LP sleeve alone. The cover features Dom, an antique car, and a strange looking person/mannequin in the background. It kinda looks like Kenner in a stage outfit, or John Travolta circa 1978. The back has a great picture of Domenic live, possibly with the James Gang. A spotlight shines on him as he plays his custom Tele. "All Night Radio Show" is a great example of how Domenic is perfectly capable of writing high-quality pop-rock songs. It's a wonderfully sentimental and beautifully crafted tune. "If You See Me" is basically an acoustic version of "The Answer" from his first album. Like "The Answer," it is one of his strongest songs, containing a long break where he gets the chance to solo. Hearing Dom play a solo on an acoustic guitar is an extra treat. It also features great organ playing by "Smitty" and a violin solo by John Weider. An interesting hybrid of bluegrass and funk, "If You See Me" displays Troiano's ambition as a writer and arranger. "My Old Toronto Home" is a nice, pensive song with an R&B feel to it. As with "All Night Radio Show," Dom sings the song in a light, raspy voice; the result is unforgettable. Next is "All I Need is Music," which is a rewrite of an early Troiano song from his days in Bush. The lyrics have been revised and the tempo is a bit faster. The track features a blistering instrumental section, and overall, it is better than the song it copies. Side two consists of four songs tied together in one eighteen-minute jam titled "Tricky." "Fanny Mae" is a blues oldie performed with real conviction and spirit. The vocal performance and guitar work capture the essence of Troiano's appeal. "Blues for Ollie" is a hot instrumental with a horn section. "I'll Get My Own" starts out fairly laid-back but with a tight groove. Gradually, the musicians play softer and softer until the only thing that's heard is a ride cymbal. Then the instruments come back and kick the song into high gear. The album and the medley end with an odd instrumental called "The Greaser," which features heavy percussion and a samba-like beat. As arranger and producer, Troiano is interested in encouraging dialogue between instruments, and he has therefore given a great deal of thought to dynamics and voicing, qualities often neglected on rock albums, the lack of which prevents a development of depth or pulsation from mood to mood. Tricky has a great deal of fine jazz-rock guitar work, but Domenic Troiano is most interesting for his overall arrangements.